I first learned of John Cage’s work when I attended high school. I can’t remember if it was art class or something else. But, I was tipped off somehow. My love of his ideas at a young age even involved me stealing a plastic record out of a library book just to hear the piece. It had never been played, although the book was probably 20 years old at the time. It really does prove the point that if you want to do something subversive in society (artistically), hide it in a book. John Cage (Official) has always been an important influence on my thinking in regard to making things, whether they be written or drawn or played. Of the many recordings available, the most treasured ones include his own voice. Those really captured something for me. Since I first heard Indeterminacy (with sounds performed by David Tudor), I was hooked. In fact, Variations was the next stop…but, only for a short one…then, back to the “readings” he’d recorded. I had moments addicted to his visual work (example 1 and example 2). But, that didn’t last long. The most important recording was an 8-CD set published by Wergo a few years ago. It came with a hefty price of just over $100. 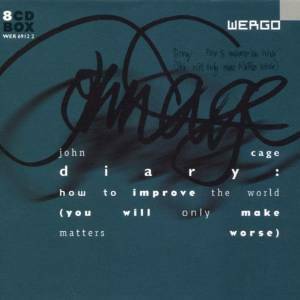 Listen to Cage’s Diary for free now. While you are at it, download the “prepared piano” app.